In news that shouldn’t come as a surprise to anyone, Sony has revealed that the PlayStation 4 had a really impressive 2017. According to Sony’s most recent numbers on its website, revealed that the PlayStation 4 sold more than 73.6 million units globally as of Dec. 31, 2017, thanks in part to a spike of 5.9 million units sold during the the holiday season (defined as the period between Nov. 20 and Dec. 31). As one might expect, the hefty amount of hardware sales were followed by plenty of software sales and Sony revealed there was an overwhelming amount of them. 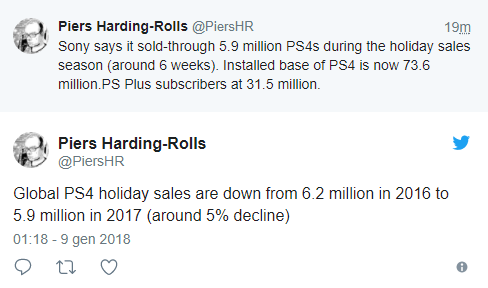 Within the holiday season alone, 55.9 million PS4 titles were sold both in retail stores worldwide and through digital downloads, pushing the total amount of copies sold as of Dec. 31, 2017 to 645 million. As suggested earlier, the fact that the PlayStation 4 managed to have such strong numbers in 2017 shouldn’t really come as a surprise. Though Sony didn’t release a new console like Nintendo or Microsoft, it still found success thanks to its consistent offering of games which provided impetus for players to purchase existing hardware. That said, it did suffer a slight drop in sales when compared to the 2016 holiday season (6.2 million), but considering that it was up against the Switch (which is still selling at an astonishing rate) and the Xbox One X, such a result is to be expected.